Asian School of Business (ASB) proudly hosted the famous media personality, Prof. Karl Bardosh, Master Professor – New York University, Tisch School of Arts on 20th Feb 2019 for a ‘Guest Lecture Session’ for its students of BBA and BCA. 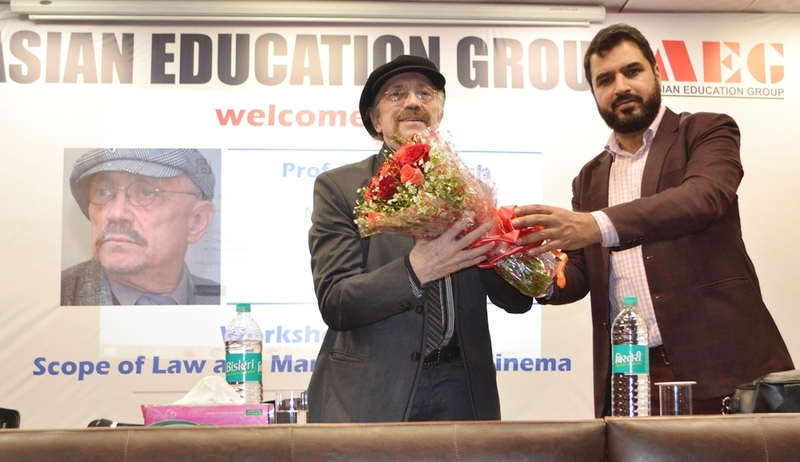 The main aim of his visit was to have an interaction with students from the campus regarding various opportunities in the emerging field of ‘Mobile Cinematography’. The distinguished guest speaker described how even an amateur person, and that too with not so high resources, can start working upon it and develop quite good short films. According to him, “What they need to do is to come up with an idea, create a storyboard, get feedback and start editing to make a short film out of it.” In short, he explained as to how the students could come out with short mobile films that may go all the way to Cannes Film Festival! It may be added that Prof. Karl Bardosh also happens to be the Academic Advisor at Asian Academy of Film & TV (AAFT) – the leading film school located in India’s Noida Film City in the National Capital Region and popular for film studies. Moreover, he has also pioneered a unique course – ‘Cell Phone Cinema’ – at Kanbar Institute of Film & Television (NYU Tisch School of Arts) and has been teaching 28 different courses in Film & Television Production, History, Criticism, and Writing – embracing all genres from narrative workshop to research and also writing for the documentary. Besides being an outstanding film educator, he is also an award-winning director, producer, writer and editor of features, shorts, television series and documentaries. He is well-traveled and has worked in Europe, Asia, Brazil and New York. Among his many achievements, he had initiated the world’s first network television educational series on the Aesthetics of Film (Hungary, 1967). He had also written, directed and edited the first American documentary on Bollywood and Indian Parallel Cinema for the American Public Broadcasting System (Bombay, 1992). It goes without saying that BBA & BCA students of Asian School of Business had a highly rewarding experience by attending this wonderful session with such a great media personality!